Over the last fortnight, EqualiTeas events have been taking place across Britain to mark the centenary of women being given the right to vote in 1918, and parity of the franchise between men and women which took place a decade later. On 2nd July 1928, under Stanley Baldwin’s premiership, the Representation of the People (Equal Franchise) Act 1928 became law. This date was marked at EqualiTeas events including one at Crawley Museum which I was delighted to speak at. It is vital we honour the sacrifices made for our democracy. Also important is that we pay tribute to those who protect our way of life. Last Saturday also marked Armed Forces Day, a time to give our support to this nation’s serving troops, service families, veterans and cadets. We will never forget their sacrifice and their service. Wishing Gareth Southgate, the England national football team manager who grew up in Crawley, and his squad the best of luck in the 2018 World Cup. The flag of St George is flying proudly in Parliament! I remember being at a National Citizen Service graduation ceremony just a few days before Gareth was appointed permanent England manager – who knows what our town’s next generation will go on to achieve? Ahead of the National Health Service 70th anniversary this week, it has been confirmed that NHS funding will grow on average by 3.4 per cent in real terms each year from 2019-20 to 2023-24. By the end of this period, the NHS England budget will increase by over £20 billion per year in real terms compared with today; £394 million a week higher and a commitment going far beyond the Brexit dividend which is being spent on our Health Service. The funding increase will mean the NHS can lay firm foundations for service improvements. This is to be front-loaded with increases of 3.6 per cent in the first two years, which means £4.1 billion extra in 2019. While services have been returning to Crawley over the last eight years after the closure of maternity and A&E in 2001 and 2005 respectively I questioned the Health & Social Care Secretary in Parliament over the importance of this funding boosting local healthcare provision. Another priority must be to focus on prevention as well as cure. I have made continued representations with the Health & Social Care Secretary and NHS officials on services and treatments, as well as wider psychological support for patients. I additionally raised these issues in Parliament including during a debate on NHS care which I secured and led earlier this year. Standing up for Crawley school pupils: Like many parents in Crawley I am concerned about issues at Thomas Bennett Community College regarding changes announced by their parent body, Kemnal Academies Trust (TKAT). Prime Minister’s Questions: I continue to press Govia Thameslink Railway management not only about the disruption which comes as a result of the network-wide timetable changes last month, but to seek assurances on mitigating the disruption to services during the significant upgrade investment work in the October 2018 and February 2019 half-terms. This is a cause I continue to pursue at the highest levels. During Prime Minister’s Questions last month I made clear to Theresa May that Crawley rail passengers want the trains to arrive without delay and urged her to ensure delivery. It is right that the GTR franchise will be broken up in 2021, however we must see an improvement of services now or it will need to be removed sooner. As a founding member of the All-Party Parliamentary Group on Southern Rail I continue to lobby for improvements. Raising local concerns and holding the Government to account: My schedule often contains many different commitments over the course of a week and these bulletins are only a snapshot of my work. In the space of just a few days I spoke in the House of Commons on Brexit, animal welfare and the ongoing conflict in Yemen, as well as chairing cross-party meetings regarding cancer treatments and cardiovascular disease, in addition to following up on the service provided to local rail passengers. Keeping our country safe: The North Atlantic Treaty Organisation (NATO) has been the bedrock of our national defence since its formation seven decades ago. The Prime Minister will represent the UK at next week’s NATO summit, which is expected to address issues including our relationship with Russia, as well as the contributions and capabilities of member countries. Britain’s national defence budget for 2018-19 is around £37 billion and will rise by 0.5 per cent above inflation every year to 2020-21. Indeed, the UK is one of only five countries to not only meet, but exceed NATO’s two per cent spending target. There is, of course, no excuse for the Leader of the Opposition’s comments describing this alliance as a danger to world peace. Time to end foie gras imports: Following the conclusion of two days of House of Commons debate on the EU (Withdrawal) Bill came the debate I secured on an animal welfare issue which is also linked to carrying out Brexit. After leaving the EU’s single market, Britain will be able to make the decision to ban imports of this so-called delicacy. I urge the Government to take this action in line with the progress we have seen in recent years in the area of animal rights. Taking a stand against cancer: Backing Cancer Research UK’s call to stand shoulder to shoulder with the NHS against cancer, so that everyone has the best possible chance of surviving this devastating disease. Every year, 500 people are diagnosed with cancer in Crawley. With this number set to rise, it is vital that we have an NHS which is fit to deliver world-class care for all cancer patients now and in the future. 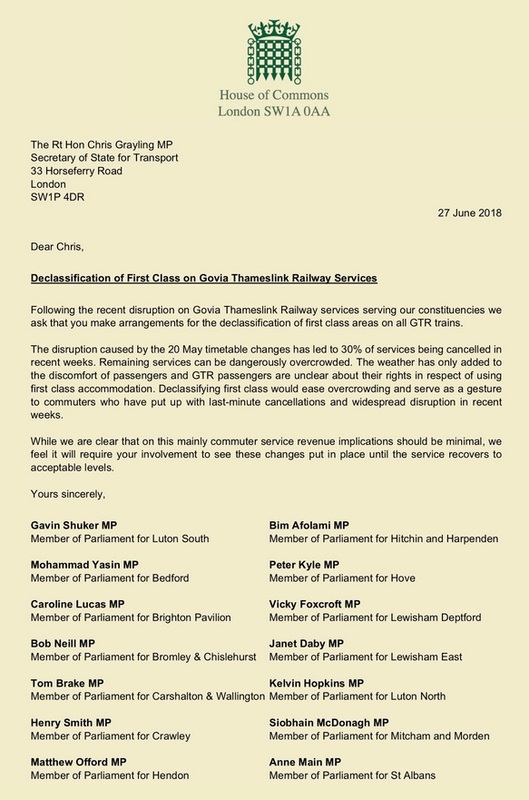 Declassification of first class rail services: Signed a cross-party letter to the Department for Transport calling for the declassification of first class services on Southern and Thameslink routes in light of network disruption. I welcome the Rail Minister’s swift and positive response on this issue. Pet theft: Speaking in Westminster Hall in support of strengthened animal welfare regulations to help tackle the theft of family pets. British Dyslexia Association: Delighted to become a Vice President of the BDA. They are such an important organisation who undertake vital work to support the one in ten people – myself included – with dyslexia. As a Vice Chair of the All-Party Parliamentary Group for Dyslexia & other Specific Learning Difficulties I’m delighted to support their advocacy for people with dyslexia and the continued assistance they provide. Animal testing: Praised the contribution of one of Sussex’s most well-known and ethical companies, The Body Shop, in securing nearly six million signatures for their Forever Against Animal Testing petition. I visited their Crawley store to thank staff for their efforts in raising awareness of this petition, which is to be presented to the United Nations later this year. Rail compensation: Contacted the Transport Secretary this week calling for compensation for Thameslink passengers following disruption last month. Universal Credit: My thanks to Crawley Jobcentre Plus staff for their work on the local rollout of Universal Credit. Medical cannabis: Welcomed the Home Secretary's confirmation of a review on medical cannabis use.